Your child’s strengths and challenges are unique, so it only makes sense that learning should never be one-size-fits-all. The certified instructors at Sylvan Learning in White Plains are here to provide the personalized learning experience that’s right for your child, so he or she can accomplish his or her goals in the classroom and beyond. At Sylvan, we go above and beyond personal tutoring. From cutting-edge courses in STEM (science, technology, engineering and math) to math skill practice and college and career prep, we motivate students to accomplish their goals — all while having plenty of fun in the process! We know just how to improve scores and confidence — and we have the results to show for it. At Sylvan, we know how to get results — and it shows. Compared to non-Sylvan students, our students typically see up to two to three times greater results in their reading and math scores. How is this done? We unite expert teaching with collaborative, interactive technology to create an engaging learning experience that’s fun, but never frustrating. Our teachers are here to make sure your child is learning at exactly the right pace, skill level and style that’s best for him or her. You can be assured your child will stay motivated and inspired at all stages of the learning journey. Whether your child is just starting out with kindergarten math or you have a teen who could use some extra guidance with algebra, you can be sure we have the math programs that meet your family’s needs and budget. Through interactive technology, hands-on exercises and fun puzzles, we leave frustration behind and make learning math a fun and exciting experience. Our teachers know just what goes into teaching math in school these days. (Yay!) At Sylvan, our programs are specifically designed to help kids achieve real results in the classroom. At Sylvan, we take pride in being the largest branded provider of STEM programs in North America. These interactive courses are designed to foster creativity and imagination while being big on fun! Through Sylvan EDGE programs, your child can get to grips with crucial 21st-centuy STEM skills that can help pave the way for greater success in school and even in high-demand careers. These fun, creative programs cover areas including science, math, engineering, coding and robotics. Is your teen nervous about the college admissions process? Help him or her feel confident and prepared with our ACT® and SAT® test prep programs and college prep courses. From college prep writing to test prep and advanced study skills, you can count on Sylvan for the comprehensive programs your son or daughter needs to feel prepared for the challenges of college and the job market. Get started on the path to success! Before you sign your son or daughter up for tutoring, you want to make sure that the tutoring program you choose will lead to success in school. When you choose Sylvan for personal tutoring in White Plains, you can rest assured you’re getting a full team of experts with a track record of achieving great results. In fact, our students see up to two to three times more growth in their reading and math scores than their peers. From our expert tutors and personalized learning plans to our nearly 40 years of experience, we know exactly what it takes for students to succeed. Sylvan Learning, the leading provider of personal learning for kindergarten-12th grade students, offers tutoring in reading, writing, math, study skills and test prep, and STEM classes in robotics and coding. Sylvan’s proven tutoring approach combines certified teachers delivering personalized instruction using curriculum aligned with common core standards, and the latest iPad® technology. Sylvan also offers Sylvan Prep SAT® and ACT® courses. 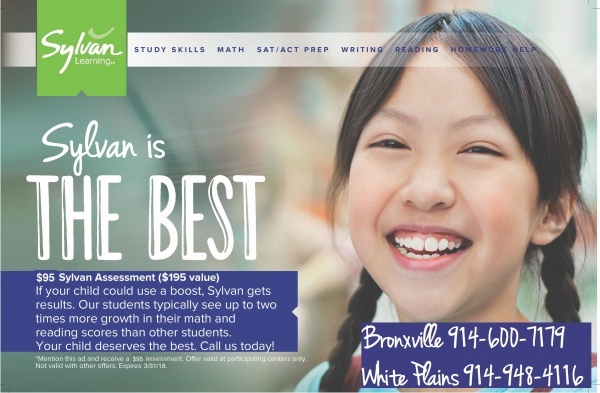 Sylvan Learning Centers are conveniently located in Bronxville and White Plains.